In Memory of Sister Josepha Kruchinsky, M.S.M.G. Assumption Catholic School will be closed on Friday, October 2, 2009. Sister Josepha Mary Kruchinsky, M.S.M.G., 87, fell asleep in the Lord at the convent of the Missionary Sisters of the Mother of God, Stamford, CT, on Sunday, September 27, 2009. Born in Primrose, PA, on June 30, 1922, she was the daughter of the late Steven and Yustina (Kit) Krichinsky. 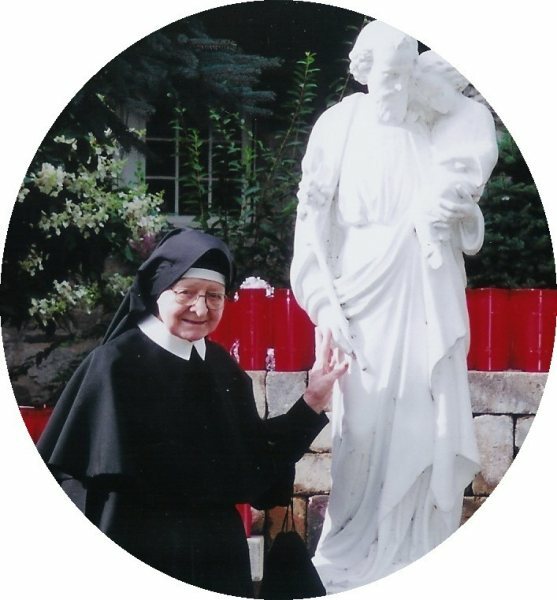 Sr. Josepha was a member of St. Nicholas Ukrainian Catholic Church in Minersville, PA. She graduated from Minersville H.S. in 1940, and was employed at a local textile factory. She joined the Congregation of the Missionary Sisters of Mother of God on June 19, 1945 and professed her Final Vows of poverty, chastity and obedience on January 1, 1957. Sr. Josepha earned a bachelor’s degree in biology from Alberta Magnus College and a master’s degree in educational administration from Fordham University. She taught at Mother of God Academy in Stamford, CT, from 1953 until 1963, at which time she was appointed the first principal of Ukrainian Assumption Catholic School, in Perth Amboy, NJ. She held this position for 31 years, 25 of which she was also a full time teacher. Her greatest joy was preparing children for First Holy Communion and the Sacrament of Penance, and acquainting them with the liturgical beauty of the Ukrainian-Byzantine Rite. She was preceded in death by four sisters: Anna Ternowchek, Mary Kruchinsky, Tess Kruchinsky, and Helen Schumack; her brother, Steve Kruchinsky; two brother-in-laws, Samuel Ternowchek, James Schumack; a niece, Catherine Ondisco; a nephew, Joseph Schumack; and a grandniece, Karen Ternowchek. Surviving are: nieces, Mary Ann Kelemen, Theresa Laubenstein, Anna Kovich, Christine Ternowchek; nephews, Michael Ternowchek, Samuel Ternowchek, Jr., John Ternowchek, and Richard Schumack; eleven grandnieces; seven grandnephews; seven great grandnieces; and ten great grandnephews. A viewing will be held at Lacerenza Funeral Home, 8 Schuyler Street, Stamford, CT on Thursday, October 1, 2009 from 2-8 p.m. A Requiem Divine Liturgy will be celebrated at 11:00 a.m. on Friday, October 2, 2009 at Ukrainian Assumption Catholic Church, Perth Amboy, N.J., prior to this there will be a 10:00 a.m. viewing at the church. Burial services at Mother of Sorrows Cemetery, Langhorne, PA. In lieu of flowers, the family requests donations to the Missionary Sisters of Mother of God, 711 N. Franklin St. Philadelphia, PA 19123.